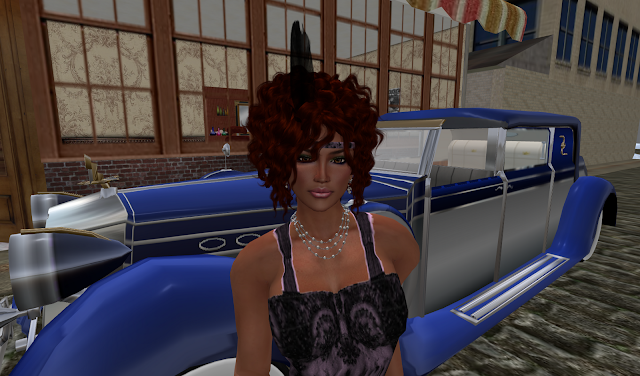 During my time running a 1920's themed sim I have acquired quit the vintage wardrobe. I haven't seen a vintage blog so I thought I would start showcasing a few of my outfits. We have several fabulous designers that have shop's on our sim so I thought it wouldn't hurt to showcase them as well. My "Flapper out on the town" outfit is a dress designed by Cilian Shepard of Cilian'gel 1920's Boutique, accessorized with jewelry from Tiffy Villa of Eclectica and N-Core shoes (my favorite shoes of all time!!!). I am wearing black stockings option. I did have to adjust the color a bit to match the stocking I have on. Car Monarch Motors "Imperial Royal Sapphire Town Car"